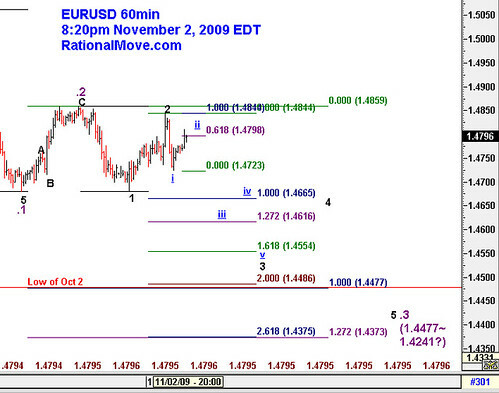 Retrospective & My current speculation of the course $EURUSD might take, originally uploaded by Rational Move. Let’s face it. I took almost 80 pip loss on today’s trade after hard-work-no-gain net +5 pip trade. 1. Was I keeping my rule? 80% positive. I constructed scenario, and defined the condition that would keep the position valid. The risk is clearly defined, and potential reward justified the risk taking. I did not move my stop order in the direction that increases the loss.I did not average loser. 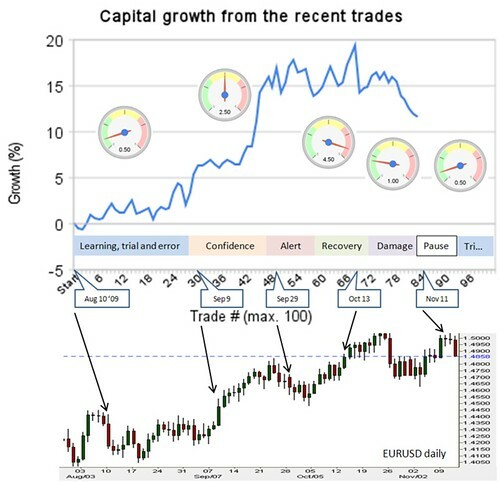 One thing I need to reflect on: Was the trading span (from entry to exit) too short? Probably yes, and it demanded too much attention during the day. 2. Am I reducing the bets? Yes. I am keeping the max loss as small as 1% of the capital until I start to win again. 3. How much am I disturbed emotionally? I would say 25%. The loss level is well under control. Not thing is threatening my capital. But I am a human, and of course feel bad when I had to take the loss. I seem to be doing fine, and I can continue with a little caution. am currently drawing EURUSD price course as in the labels of the chart, and keeping my short position from 1.4775. Stop is 1.4850. I will close the chart and take a rest for tonight.